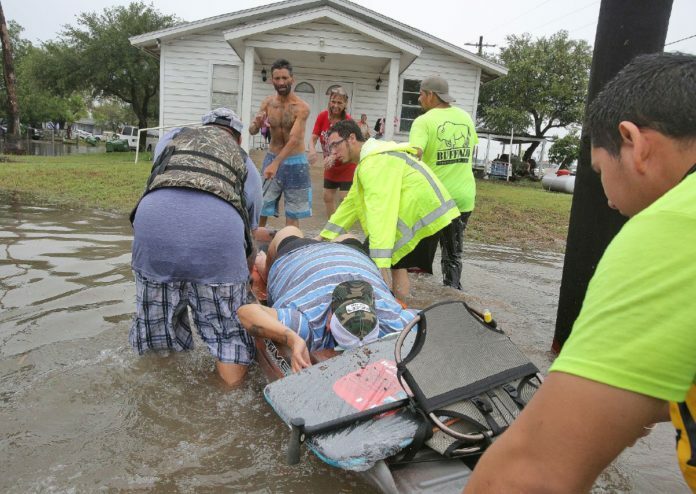 Volunteers move stranded residents by raft from their home to the Templo Betania church before they were driven to a shelter at Sam Houston Elementary as heavy rains caused water to rise and flood whole neighborhoods on Wednesday, June 20, 2018, in Weslaco. Gov. Greg Abbott recently sent a letter to U.S. Housing and Urban Development Secretary Ben Carson requesting nearly $371 million to “jumpstart a strong recovery” from June floods that imparted heavy damage throughout the Rio Grande Valley. We hope Carson sees fit to allocate the funds, taking to heart the governor’s statement that “(t)his is a community of limited resources that would greatly benefit” from the help. Any HUD funding sent here could be used to repair infrastructure damaged by the rains and subsequent flooding. It certainly would help; although President Trump issued a disaster declaration for Cameron, Hidalgo and Jim Wells counties following the floods, the Federal Emergency Management Agency denied requests from local city and county governments for funding to make such repairs, although the agency did issue about $30 million to individual homeowners and businesses. Without infrastructure improvements to reduce the risk of future flooding, however, any repairs funded by those individual grants could last only until the next major storm. Any recovery from such major events — in fact, all utilization of taxpayers’ money — should strive to be as efficient as possible, and reduce the need for future allocations. Thus, improvements to drainage systems and other infrastructure can be a one-time expense that can reduce the need for repeated homeowner claims from storm damage to personal property that might have been reduced if not eliminated by the infrastructure improvements. Not to mention the incidental and indirect costs that potholes and other defects from storms and floods inevitably create. In addition to the hazards of hitting such obstacles unexpectedly, studies have shown that damaged roads create millions of dollars in hidden costs by damaging cars and other vehicles, in addition to the obvious safety hazards. Alignment problems, damaged suspensions and cracked windshields are just some of the costs drivers must endure, and that are hard to prove are directly related to road hazards created or worsened by storms. Gov. Abbott noted in his letter that he understands that the state must compete with claims from other areas for limited funds, and some events, such as the recent hurricane damage to northern Florida or similar flooding in Central Texas, received more national attention. But the needs in the Valley are just as real as they are in those areas. Thus, we hope along with local and state officials that HUD will see fit to recognize those needs in all areas and make its allocations accordingly.